Gutter Guard can be installed on most roof types. Prior to installation gutters and downpipes will be completely cleaned out to ensure the best possible results. Aluminium and plastic mesh have a diamond profile to catch water and stop it from sheeting off the roof. Gutter guard is attached to the lip of the gutter with a Colorbond angle trim the same colour as your gutters and stitching screws. The mesh is then pulled over the first run of tiles and tucked under the second row leaving a neat and smooth result. 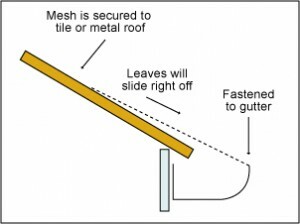 Gutter Guard is attached to the gutter the same way as it is done on a tiled roof. 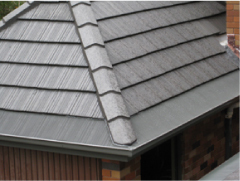 When fastening the Gutter Guard to the roof colorbond saddle clips are used. 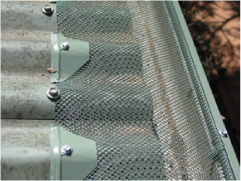 If Gutter Guard is being installed on a corrugated Iron roof the mesh is cut to size so it is hidden as much as possible.